View More In Candlestick Holders - Page 2. Do you light candles for religious or decorative purposes? Need a steady base to hold them securely in place? Look no further. This Crystal Candlestick Set by Ner Mitzvah is your solution. Their sturdy square base make it the perfect choice . These candlesticks' elegant design in a universally-flattering crystal finish suits the color scheme of nearly any setting. While beautiful enough to be used for purely decorative purposes, these candle holders also work well for religious ceremonies and special occasions. Kindle your Shabbat candles use as part of a memorial ceremony, or on your home or restaurant table to create a romantic ambiance for a candlelit dinner. These candlesticks are also suitable for spas, hotel lobbies, resorts and more. The possibilities are endless! 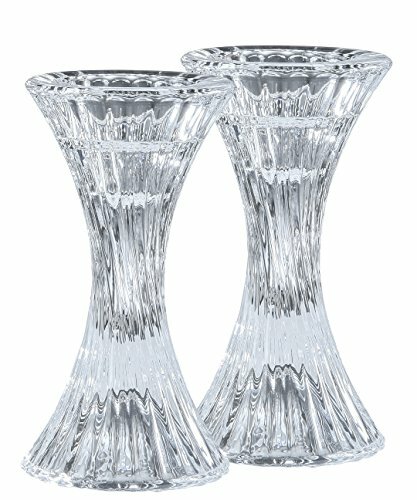 What better way to delight your candle-loving friend or family member than with Ner Mitzvah's Fine Crystal Candlestick Set? Countless candles will be held up by our long-lasting, durable candlesticks. A beautiful accent to any home, this candle holder set is an especially appropriate gift for newlywed couples or a housewarming. It also makes a beautiful present for holidays, birthdays and anniversaries year-round. Family-operated since the 1940's, Ner Mitzvah is an expert candle-maker, delivering a wide selection of products at the highest quality with personal customer service. ELEGANTLY CARVED: These crystal candle sticks feature a fine sleek design, carved with beautiful craftsmanship and quality construction. MAKE IT YOURS: Choose from a 3" or 5" or 8" set to fit seamlessly into any setting, whether a wedding or celebration hall, a candlelit romantic dinner at home or a restaurant. Fits all standard candle sizes and TeaLights. ACCENTUATE YOUR DECOR: The shiny crystal surface of these candlesticks complements any decor with a touch of sophistication and class. Plain candles will appear elegant in these ornate holders. MULTIPURPOSE USE: The elegant design of these candlesticks befits use for religious rituals and ceremonies, such as lighting Shabbat candles, as well as for party and special occasion decoration. MAKES A GREAT GIFT: Looking for a perfect wedding present for a newlywed couple, a housewarming gift, or a gift for a host or hostess? These beautiful pieces are great additions to a mantelpiece. If you have any questions about this product by Ner Mitzvah, contact us by completing and submitting the form below. If you are looking for a specif part number, please include it with your message.